Hungry? Why not grab something from your flower garden. There is certainly more than one way to compose a garden salad. Most Mainers have no trouble throwing together various and sundry garden vegetables as they ripen in rapid succession during the summer season. But most stop short of whipping up a salad solely from ingredients found in their flower patch. The word you didn’t know you needed here, one that embodies a pretty vast class of edible ornamental flowering plants, is “edimentals.” The phrase was coined by Stephen Barstow, a blogging British oceanographer living in Norway who has dedicated the last 30 years of his free time to trialing and tasting edimentals. In 2003, he set a world record for the including the largest number of edimentals in a single salad: 537. Who knew anyone kept such records? Nasturtiums are a common bloom to make it into the salad bowl. Many a bag of farmers market mixed greens has been beautified with these spicy, multi-colored, completely edible flowers. But 88-year-old Cape Elizabeth resident Elsie Maxwell wrote to my editor asking why folks in Maine bristle at the thought of eating flower garden variety hostas. After all, why should deer get all the spoils of the hosta patch? Maxwell belongs to a family of farmers and lives in a farmhouse surrounded by all kinds of hearty, shade-tolerant hostas. She was introduced to the prospect of hostas on her plate by her daughter, who lives in Japan and can buy young shoots called urui as easily as we can get our hands on asparagus in springtime in Maine. “If you’ve got a salad growing in your side yard, you might as well eat it, right?” Maxwell said. Barstow explains in his book, “Around the World in 80 Plants,” that the genus Hosta comprises 45 species of clumpy perennials native to Japan, Korea, China and eastern Russia, many of which were introduced as ornamentals to Europe in the 18th century. Today, there are over 5,000 known hosta cultivars worldwide, bred more for beauty than taste. That said, their shoots, leaves and flowers are all pleasantly edible and are known to be high in vitamin C, although a full nutritional evaluation of the plant is hard to find. The shoots, harvested in the spring, in moderation, close to the base, will not hamper the mature leaves’ overall shading potential and taste like a cross between asparagus and a young green bean. Like any vegetable, they should be washed and then can be either chopped and used raw in salads or be blanched and finished with a quick sauté. Try them as a side dish with butter, garlic and lemon, or sesame oil, soy sauce and ginger. The young leaves can be harvested – best to do so in the morning when they are at their most succulent – and used like spinach (see recipe for hostakopita). The flowers that come later in the summer are edible, but more decorative than flavorful. As with any type of foraging – even in your own flower bed – do not eat them if they were sprayed with chemical pesticides or grow near the road. Hostakopitas with a collection of edible flowers. including hostas, lilacs, begonias, mustard green flowers and chive blossoms. Another widely grown, but rarely eaten, edimental in Maine is the daylily. The tubers attached to its ropey roots, early shoots, whole buds and bright petals are all edible. Brunswick Inn executive chef Ali Waks Adams is working with South Portland Wine Company to put on a wine dinner at the inn in early July that will feature edimentals. She’s not yet finalized the menu because she needs to wait and see what will be in bloom given the colder than usual spring. But she is toying with the idea of stuffing daylilies with garlic goat cheese and chive blossoms and serving them side by side with the more widely known stuffed squash blossoms so diners can compare the two. The daylilies are sweeter. Pickled pansy buds may be on the menu, too – they work in the kitchen like capers, also marigold compound butter to top grilled chicken or fish. Waks Adams has violets preserved in sugar, is looking to either lilacs or honeysuckle for use in syrup, and knows that rose petals will be in the mix, perhaps in a duck main dish reminiscent of a luscious scene she recalls from “Like Water for Chocolate” by Mexican novelist Laura Esquivel. Waks Adams says she’ll certainly tap herbs that have flowered to layer flavor into dishes that include thyme, rosemary, fennel and borage (these last taste like cucumber), and hopes to surprise diners with foraged flowers from black locust trees and elderflower bushes. I understand the attraction, for sure. But wonder – if a gardener has cultivated her flower beds to please her eye, would she be willing to cut them back to please her palate? Christine Burns Rudalevige wraps filling in phyllo dough to make hostakopitas. The recipes swaps out the spinach that typically stars in this traditional Greek appetizer with home-grown hostas. Yes they are edible, enjoyably so. 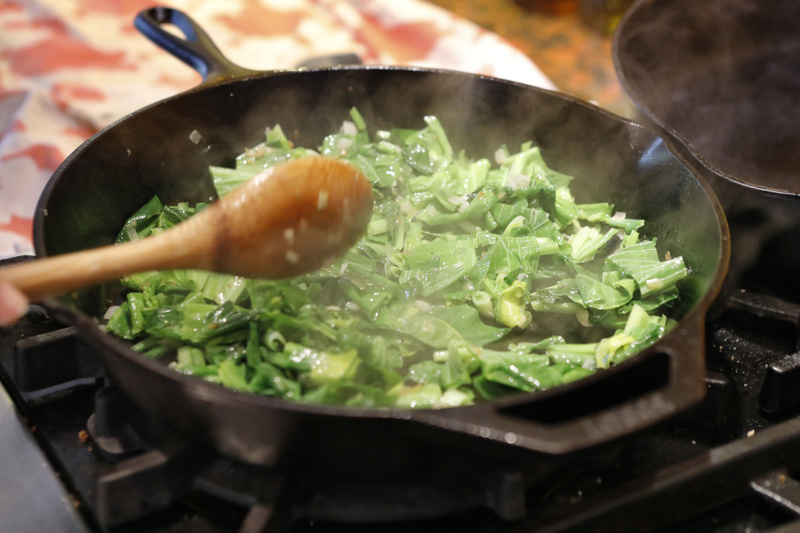 Heat the olive oil in a large heavy skillet over moderate heat, add onion and sauté for a minute. Add hosta leaves and sauté until wilted and tender, 4 to 8 minutes. Remove from heat and cool, about 10 minutes. Press the mixture in mesh colander (or wring in cheesecloth) to remove as much liquid as possible, then coarsely chop. 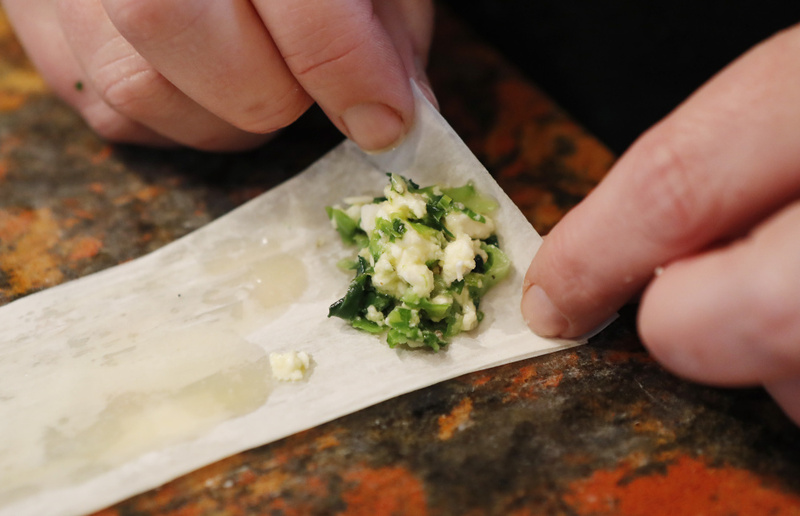 Transfer to a bowl and stir in feta, egg, chive blossoms, lemon juice, salt and pepper. Let the filling cool for 10 minutes. Preheat the oven to 375 degrees Fahrenheit. Melt the butter in a small saucepan, then cool. Cover the phyllo stack with a damp kitchen towel. Take 1 phyllo sheet from stack and arrange on a work surface with a long side nearest you (keeping remaining sheets covered) and use a pastry bush to lightly coat it with the melted butter. Top with a second phyllo sheet and brush with more butter. Cut the buttered phyllo short stack crosswise into 6 equal strips. Put a heaping teaspoon of filling near 1 corner of a strip, then fold corner of phyllo over to enclose filling and form a triangle. Continue folding the strip (like a flag), maintaining the triangle shape. Put the triangle, seam side down, on a large baking sheet and brush the top with more butter. 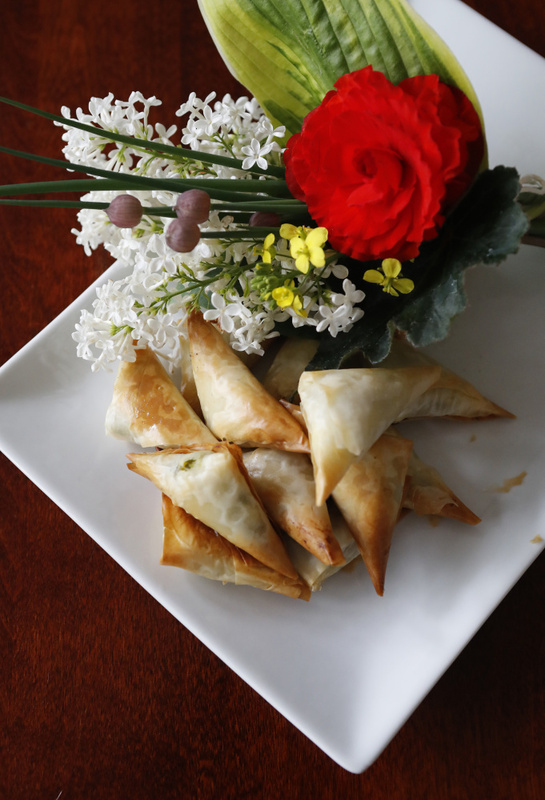 Make more triangles in same manner, using the rest of the phyllo. Bake the triangles in the middle of the oven until golden brown, 10 to 12 minutes. Transfer the baked hostakopita to a rack to cool slightly. Make-ahead note: Pastry triangles can be formed, but not baked, 3 days ahead. Arrange in 1 layer in heavy-duty sealed plastic bags, then freeze. Bake frozen pastries (do not thaw) as instructed above, adding 2 minutes to the baking time.